This CD features Kari Kriikku with 20th-century works for clarinet and orchestra, including two new works by Finnish contemporary composers. Jukka-Pekka Saraste leads the Finnish Radio Symphony Orchestra in Debussy's Rhapsody and Jukka Tiensuu's one-movement Concerto "Puro" (Finnish for "a stream"), and the Avanti! Chamber Orchestra in Jouni Kaipainen's Clarinet Concerto. 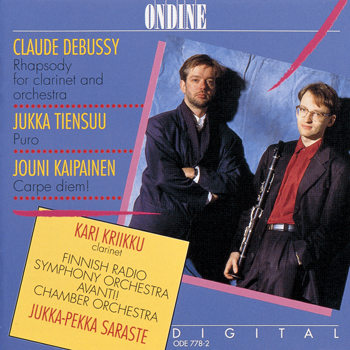 Prior to making these première recordings, Finnish clarinetist Kari Kriikku closely collaborated with Tiensuu and Kaipainen for the composition of the concertos and gave the first performances.